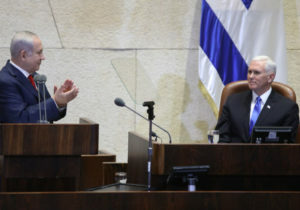 U.S. Vice President Mike Pence, in an address to Israel’s Knesset on Jan. 22, said the United States would “never allow” Iran to possess nuclear weapons. Prime Minister Benjamin Netanyahu applauds U.S. Vice President Mike Pence ahead of the veep’s speech at the Knesset on Jan. 22. “I have a solemn promise to Israel, to all the Middle East and to the world – the United States of America will never allow Iran to acquire a nuclear weapon,” Pence said. President George W. Bush was the last U.S. leader to address Israel’s legislature. Bush spoke at the Knesset in 2008 to mark the 60th anniversary of Israel’s becoming an independent nation. Pence’s message was “meant not only to reassure Israeli leaders, but also Sunni Arab states across the Middle East concerned by President Barack Obama’s efforts to reach out to Iran,” Israeli news outlet Arutz Sheva noted.